Opera Cake is a very famous French Pastry, where almond sponge cake is soaked in coffee syrup, topped with french coffee butter cream and finally glazed with ganache. This cake is a labor of love as it is labor intensive. It can be prepared in 3 phases. First day prepare the sponge cake, second day prepare the butter cream and coffee syrup, and third day prepare ganache, chocolate glaze and assemble the final cake. The taste is awesome and worth the effort. I skipped the ganache to make it a little lighter. NOTE: The key for a good opera cake is evenly soaking the cake with the coffee syrup without sogging it down. Blanch almonds. Soak almonds in hot water for 30 minutes and then peel the skin off. Dry the almonds well on a paper towel and then powder in mini food processor. All ingredients need to be at room temperature for best results. Pre heat the oven 425 F.
Grease a half sheet pan with melted butter. Cut parchment paper exactly to the size of the pan. If it is too long , it may make the corners jagged. Aadd the eggs to mixing bowl. To the eggs add sieved powdered sugar beating until pal yellow and sugar has been incorporated well with the eggs. The mixture would have increased in volume. Add the powdered almonds and all purpose flour to the egg mixture blending until smooth with no lumps. While this is happening, separate the other egg whites from the yolk. The bowl has to be clean. Reserve the egg yolks for making buttercream. While the almond mixture is incorporating, prepare the meringue. Beat the egg whites until it reaches soft peaks. Now add the granulated sugar and beat again until it reaches stiff peak. DO NOT over beat the meringue - it may become flat. Fold the meringue into the almond mixture taking care not to flatten the mixture. Add melted butter and vanilla to the batter. Grease the parchment paper with melted butter again. Pour the batter into the pan and spread it using a spatula. Take care to spread the batter on the corners. Corners are the culprits for not getting even sized sponge. Bake the sponge for 5-7 minutes or until the sponge is springy to the touch. DO NOT over bake - cake will become hard. Turn the sponge over a parchment paper and let it cool. Once one side is cooled, turn it over and peel the parchment paper and let the other side cool completely. If you are going to freeze wrap it using a cling wrap and freeze. If you are going to prepare the cake within 2 days, then it can be covered completely and stored at room temperature. Dissolve the coffee powder in hot water and set aside. Add the reserved egg yolks to a mixing bowl. Beat until it becomes foamy,for at least 3 minutes. While the egg yolks are mixing prepare the sugar syrup. Add sugar and water in a sauce pan. Let it reach 238 degeree F. The mixture will be bubbling hot. When the sugar is hot, immediately pour the syrup into the yolk little by little. DO NOT pour it in a hurry. DO NOT let it touch the walls of the mixer - the sugar will become crystal. Pour it little by little, mixing after each addition. Whisk the egg yolk mixture until it becomes cold. This is very important for the butter cream. The egg and sugar mixture MUST BE cooled down completely. Once it is cooled, remove the whisk attachment and insert the beater attachment to the mixer. Drop the butter one cube at a time to the mixer until it is incorporated well into the egg mixture. Beat the butter mixture on high speed for at least 5 minutes until it becomes fluffy and pale. Add the coffee and vanilla to the mixture and beat for a minute. This will make the buttercream rich in coffee flavor. Add the chocolate to a bowl. Heat cream slowly until it reaches boiling point. Pour immediately over the chocolate. Let stand for 5 minutes and then mix with a spoon until it is smooth. Whisk the chocolate using a wire whisk. Let stand for 5 minutes. The ganache has to be spreadable consistency. Take sugar and water in a pan aand let it get reduced to half the volume. Now add coffee powder and let it dissolve into the hot water. Turn off and let it cool. Prepare 2 bowls with ice water in one and cold water in the other. Add the chocolate to a microwave safe bowl, melt it in microwave one minute at a time until it is melted completely. Place it on top of the cold water bowl. The temperature would have dropped to 84 degree F. Now take the bowl out and place it on top of the hot water bowl, the temperature would have hiked to 89 degree F.
Immediately mix the butter and the chocolate. Pour the tempered chocolate on top of the cake. Cut the sponge into 4 equal sized rectangles. Apply the ganache a thin layer on top of the cake board. This will make sure that the cake comes out clean, when we cut it ,without sticking to the board. Place the first rectangle on the board. Center the cake. The up side of the cake has to remain the upside of the cake as it has lot of pores which will absorb the syrup. Soak the sponge completely with coffee syrup. Be liberal in soaking, as the cake has to be melt in mouth. We can also pierce the sponge with fork and soak it with coffee syrup. Apply a thick layer of coffee buttercream on top of the sponge cake. Place the second rectangle of the almond sponge cake on top of the buttercream. Soak it again with coffee syrup. Spread the ganache on top of the butter cream. Use an angled spatula to cover all the corners. Place the 3rd sponge cake on top of the ganache and soak again with coffee syrup. Apply buttercream on top of the sponge cake. At last apply a thin layer of buttercream on the sponge. Now comes the glazing part. We can either glaze the cake with melted chocolate or we can temper the chocolate and pour it on top of the cake. I tempered the chocolate and poured it on top of the cake. Let the chocolate set at room temperature for about 10 minutes. Trim the sides of the cake. You should have a neat rectangle part of the cake. Mark the cake with a sharp knife with lines. These lines will help us to cut the cake after chilling, without breaking down the cake. Chill the cake for about 3 hours or overnight. Bring the cake to room temperature and cut it. Top the cake with chocolate garnishes and serve. 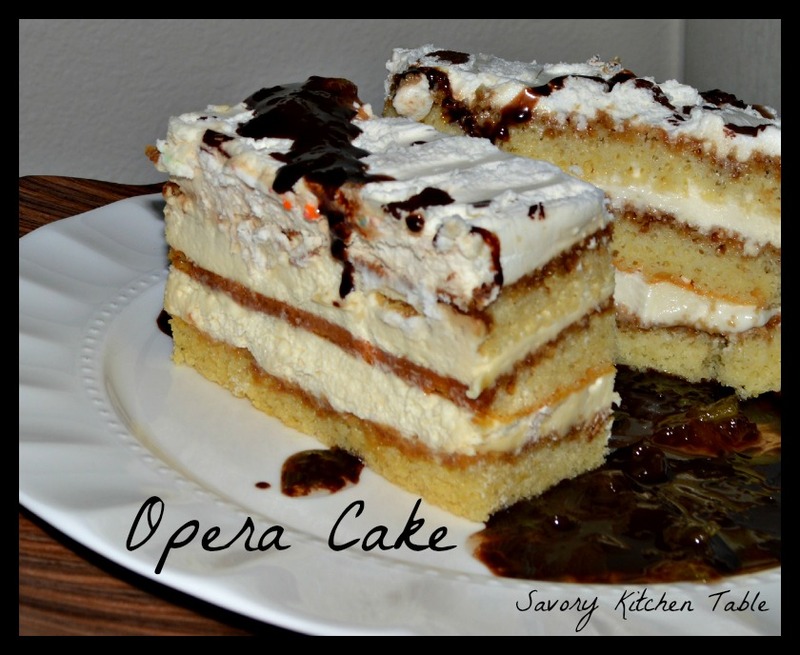 Delicious opera cake, you made it perfect. Thank you! So tasty and yummy!